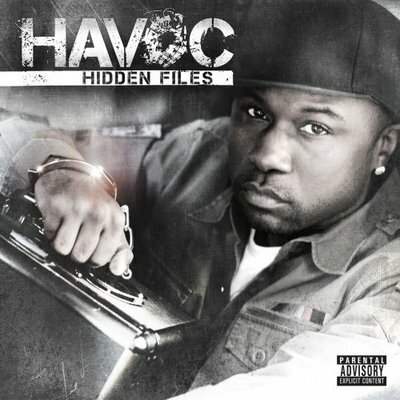 RapReviews.com Feature for March 24, 2009 - Havoc's "Hidden Files"
Just under a year after Prodigy released his (for now) swansong before a long bid - the solid "H.N.I.C. Pt 2" - his Mobb Deep partner comes with his own solo offering, released through E1 Entertainment (formerly Koch Records). His last effort "The Kush" received a near mauling on this site a mere eighteen months ago, so it is comforting to know that his new effort is substantially better. He has managed to collect a group of tracks with no outright weak efforts, consistent beats, solid rhymes and a fair bit of replay value. Can't say fairer than that. With a name like "Hidden Files" one might almost expect a "Lost Tapes" album - but that wouldn't make much sense as a Havoc solo offering. Thankfully, it is just a name - this is a conventional album, H on the production boards throughout, all new music. He has earned the right over fifteen years to be known as a distinguished producer, and taken as a set, the beats are almost always at a high standard. OK, when I say "high" I mean "accomplished" - it pretty much goes without saying that none of them are going to set the world alight, but when grouped together, they provide a solid and pleasing listen. The drums in particular hit hard on certain tracks like "Watch Me" and "On A Mission." As for Havoc on the mic, you may be pleasantly surprised. Whilst he doesn't possess the natural voice that Prodigy has been blessed with, he seems to have taken the lyrical side more seriously this time around. Perhaps the topical variety isn't quite as varied as "H.N.I.C. Pt 2" but it is just about diverse enough to keep interest. As for skills, it is certainly more coherent than P's out-of-sync recent ramblings. Guest spots are surprisingly infrequent - Cassidy is solid on "You Treated Me..." whilst Ricky Blaze turns on the Autotune to not-that-irritating effect on "Watch Me." Big Noyd and Prodigy himself turn up later, and it was probably a good idea to minimize the guest spots in order to help brand himself as a solo entity on his own LP. He definitely holds it down solo for dolo on other songs like "Walk Wit Me" and the moody opener "Can't Get Touched." The fourteen-track album clocks in at less than 45 minutes, and to give credit where it is due, it flies by and had me reaching for the repeat button. That is a testament to a simple and solid group of songs that may not create a particular mood, but "Hidden Files" certainly provides a pleasant background listen. There are quality beats in abundance, solid enough rhymes and consistency throughout. It is certainly a step up from "The Kush" and whilst it might not set the world alight, it will definitely please fans. It also manages to sound like an album - something that seems to be getting lost in the mix recently, with many MC's continuing strong mixtape form directly onto their LP's. Mixtapes and albums are completely different, and should be treated as such, and Havoc has used his years of experience to put together a strong enough album to keep him relevant.